CFP The Frankenstein Story in Children’s and Young Adult Culture Friend or Fiend? Mary Shelley’s Frankenstein celebrates its 200th anniversary in 2018. It is a work that has permeated popular culture, appearing in versions found across the globe, in all known media, and for all age groups. However, many aspects of this tradition remain underexplored by scholars. One of these is how the story and its characters have manifested in children’s and young adult culture. Like Frankensteiniana for older audiences, versions of the story for young audiences offer interesting and important approaches to the novel and its textual progeny, and they deserve to be better known and analyzed, especially since, for many, works designed for the young represent their first encounters with Frankenstein and its characters. In this session, we seek proposals that explore representations of Frankenstein, its story, and/or its characters in children’s and young adult culture. We are especially interested in how the Creature is received in these works, especially by children and young adult characters, but other approaches (and comments on other characters) are also valid. Please submit paper proposals (100 to 200 words) and a short biographic statement into the PCA Database by 1 October 2017. The site is accessible at https://conference.pcaaca.org/. Do include your university affiliation if you have one, your email address, your telephone number, and your audio-visual needs. Upon submission, be sure, also, to send your details to the organizers (Michael A. Torregrossa, Fantastic [Fantasy, Horror, and Science Fiction] Area Chair, and Amie Doughty, Children’s and YA Literature and Culture Area Chair) at FrankensteinandtheFantastic@gmail.com, notifying them of your intentions to serve on the panel. Please use the subject ìFrankenstein at PCAî. Presentations at the conference will be limited to 15 to 20 minutes, depending on final panel size. Do address any inquiries about the session to FrankensteinandtheFantastic@gmail.com. Further details on the Frankenstein and the Fantastic project can be accessed at https://frankensteinandthefantastic.blogspot.com/. Further details on the Children’s and YA Literature and Culture Area can be found at http://pcaaca.org/childrens-literature-culture/. 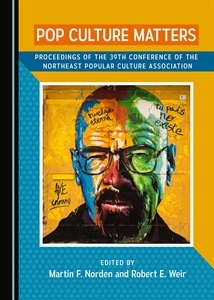 The Popular Culture Association does offer a limited number of travel grants for the conference; nevertheless, potential presenters, when submitting their proposal, should be sure to have the necessary funds to attend the conference, as no shows are noted.